it's been a little while since we did one of these. I was such a fan of Soul Eater that I wanted to crank out a drawing based off of it, before I moved on to another show, game or whatever. I took a much different approach this time. Where I normally use a lot of blending, colors, and minute adjustments, this time I kept it simple. Like, really simple. What I came up with this time around was less drawing and more ... Cartoon. Click for a larger pic. It actually took quite a while to do, too; around 4 hours, which is a lot considering that last Spider-Man I did only took 3. All of my drawings so far had made really heavy use of corrective strokes. Meaning, I would make a lot of mistakes and cover them up, adding color on color until I got something I would call acceptable. It made for a lot of different colors which, while diverse, always felt a bit messy. With this one, it wasn't exactly my original intent, but I wound up experimenting with the smooth stroke tool in Sketchbook Pro. It basically takes your strokes and autocorrects their curvatures; you don't draw with the tool so much as drag it around, and it makes for excellent lines. You can see it's effect most plainly in her pigtails and the scythe; I never would have been able to make those lines on my own. As it began to take shape I decided it looked best as a cartoon and finished it that way. If you watch the video below, you can see the original sketch and a hint of how it was supposed to look, and the direction I ultimately went. As before it's nothing to really write home about, but also as before I'm still learning to do new stuff, which is always fun. Because of the simple nature I really wasn't able to do the more fun stuff like shadows and more complicated geometry, but this had its own challenges. My drawing doesn't really match the way Maka (if you weren't familiar, that's her name) looks in the show so I had to make a few modifications to keep the shapes constant. Her nose, for instance, didn't look right until I understood that my version is in general much more circular and round, and adjusted it to be wide. In the show, her nose is always elongated vertically, and pointy. It's one of the first times I've had to make noticeable changes to make a character fit my own style, if you can call it that at this developmental stage. Definitely a cool development. Another big thing to note is that this is my 2nd or 3rd unassisted drawing; it is 100% my own. 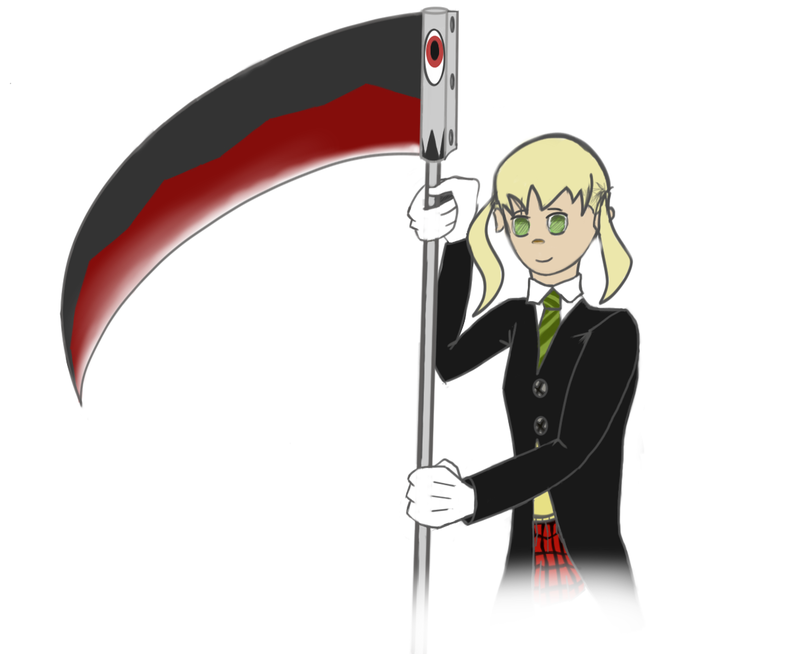 I spent a little bit of time before moving full-speed, just looking at different pictures of Maka on Google and making sure I had a general memorization of her outfit, hair and the scythe. I peeked at Google minimally after that, but occasionally did come to a parts I had forgotten to take note of. Again I realize the drawing itself is nothing special but it is exciting that it's pretty much official: I can make my own drawings instead of copying others'. That was more or less the goal of this series, though it doesn't mean I'm done learning. I don't think so, anyway; I'm still pretty interested in getting better. This was a fun thing to try, but I wouldn't count on doing too many more that are so cartooney. I just like fooling around with colors way too much on my other drawings. We'll see.